Digger Dan & Kaboom, right off the bat, has a lot going against it. For one thing, its title sounds like the name of some rejected Disney Channel cartoon trying to channel the success of Bob the Builder, and its awful CG concept art isn't doing much to combat that notion, either. Combine that with the fact that this game came completely out of nowhere, and you've got a game that would be all too easy to ignore. It would be a shame if you did, though, because aside from a few presentational issues, the game is actually extremely fun. As you might have guessed, you take control of the titular Digger Dan who does, in fact, dig things. 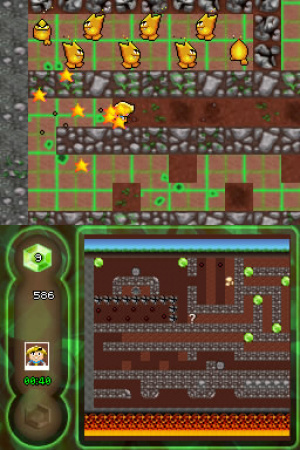 Your goal is a simple one: dig through the underground mazes, collect all the gems within them and try to make it to the exit before the time runs out. Yes we know, it all sounds dreadfully boring, and it almost certainly would be if it wasn't for the fact that these underground caves are surprisingly ingenious in their design. The actual digging isn't hard, considering Dan eradicates any dirt in his path simply by walking into it (and since he doesn't use a shovel of any kind, is it safe to assume he simply eats the dirt?) Digging does however, require strategy, and it's that very element of strategy that makes the game so shockingly compelling. Careless digging, for example, might cause a rock to fall off its dirt perch and onto your noggin, or worse – it might fall on top of a jewel, preventing you from reaching it and making it impossible to complete the level. You also have to take extra care around TNT barrels that crop up in certain levels: use them wisely and you can use them to blow up rocks to access certain jewels and bonuses, but they might also blow up said jewels and other important items if you're reckless. 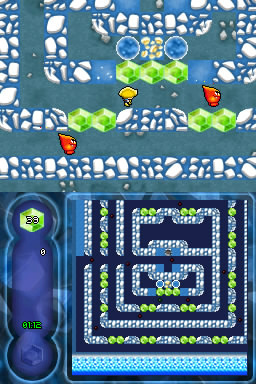 The time limit adds a healthy dose of urgency to the gameplay, though you don't completely fail the level if you don't make it to the exit in time. Rather, you simply miss out on getting a shiny gold star for the level, which is nice because it gives completionists a great reason to come back and play it again later. 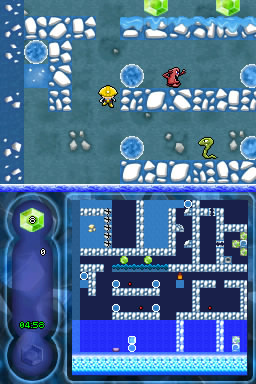 Digger Dan does a great job of consistently tossing out fun new gameplay concepts into the levels, such as a variety of monsters (some of which serve simply as hazards, while others can be strategically used in some puzzles), goo-covered platforms that slow you down, and pick axes that turn certain rocks into jewels, but the cleverest puzzles come with the inclusion of the other titular character, Kaboom. Kaboom, unlike the game's primary protagonist, has very little in common with his name. He's not an explosive creature or a circus-centric breakfast cereal; the Kaboom in question is nothing more than a tiny sleep-deprived squirrel. Despite the misnomer, the little guy helps give the game a clever tag-team element that adds a welcome twist in many of its levels. If you happen to come across Kaboom in one of the underground mazes, you can wake him up and play as him by pressing the A button. He's not very powerful, meaning he can't push blocks out of his path, but he can fit into little squirrel-sized passages. Switching back and forth between the two characters leads to some seriously inspired puzzles, especially given the twist that you have to navigate Kaboom and Dan to their own separate exits. Not only that, but Kaboom is a sleepy little bugger, and he'll fall asleep on you if you leave him alone for too long. With over 90 levels to play through and a balanced difficulty curve, gameplay variety and content are obviously non-issues for Digger Dan. The game's biggest drawback is actually quite a strange one: its complete disregard for perspective makes the visuals both odd and confusing. Now, graphically the game is fine. The character designs are largely uninspired, but the visuals are bright and colorful, and sport that charming sprite-based look. It's the way they're presented that causes a problem. Dan has a top-down-style sprite, meaning when you play the game, you're looking down on the top of his head; and because you can move up, down, left and right all over the entire stage, it feels like a top-down game. Its physics, however, act as if you're playing a 2D sidescroller. For example, if Dan is on the bottom of the screen looking up, and there's a boulder at the top of the screen, that boulder isn't in front of you, it's above you, meaning it'll fall straight down to the bottom of the screen if you were to push it, as if it had been suspended in mid-air. If that sounded weird and confusing, it's because it is. Initially, at least. It'll take you a few levels and more than likely a few deaths to get used to the illogical presentation and the odd physics that come coupled with it, but once you do come to grips with it, the game proves to be both immensely fun and rather addictive. Digger Dan & Kaboom is definitely a case of substance over flash. The game's interface is a bit rough around the edges, the character design is so-so, and the visuals have a weird perspective that takes some getting used to. As far as gameplay is concerned, though, Digger Dan is top notch. With a plethora of brilliantly-designed levels that never cease to surprise and excite, and a simple, two-button control system, this is a great game that caters to a wide variety of audiences. Whether you just want to play for a few minutes on the bus or sit down for a lengthy play-session, Digger Dan is a blast. Other than that, sounds like a good title to invest in. Thanks for the review, Jacob. It's good to have an independent point of view of the game. @ Sylverstone: More like Boulder Dash. Doesn't excite me that much. Probably not gonna get it. "illogical presentation and the odd physics that come coupled with it" - You never played a Boulder Dash game obviously. I didn't notice anything strange about it. I think the game is a 10 out of 10 and deserves a sequel. Like it fun game to play. The opening paragraph seems to reveal a lot about what's in the review to come. I saw, "has a lot against it" and thought, "Wow! This probably got a pretty high score!" This game sounds fun. Might pck it up when I have the points. DSiWare games these days are getting, um, interesting. Thank you, sir, for making a great game. 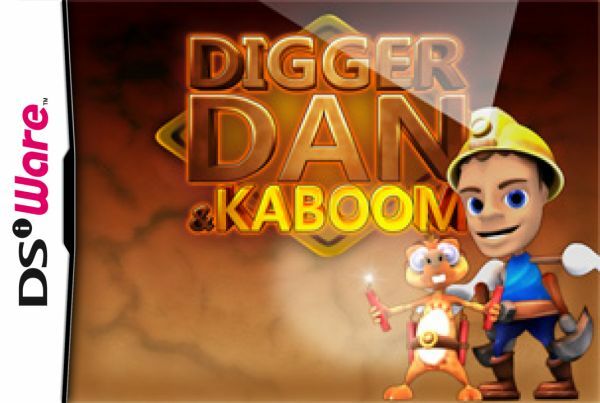 Why didn't they say miner Dan instead of digger Dan. Odd game. Thanks for the review. I like such kind of games. I will "dig it" as well. Not my kind of game. Sounds good though. Great review. I had 500 spare points so I decided to try this...I can honestly say it's one of the best games I've downloaded I was expecting a basic Boulder Dash clone, but there's a lot more to it than that...the level designs are excellent and the element of trying to find the secret gems and complete the levels within the time limits to get the gold medals is extremely addictive. I'd recommend it to anybody and I'll definitely be playing it for some time to come. Just took the plunge and i love it, well worth the 500 points well done Virtual Playground. Alright the review and the comments are enough for me I'm downloading it as I type! Excellent. Please leave feedback in a couple of days. @ImDiggerDan So I JUST downloaded this (sooo late, I know), because I wanted something like Boulder Dash-XL after finally beating it. I just want to say that I LOVE this game! I've logged a little under ten hours into it (still going strong, by the way). It's just perfectly balanced and the difficulty never feels unfair. The only weirdness I encountered was the lack of the "grab" function from Boulder Dash (i.e., where you hold the button down and use the D-pad to "grab" a gem or dirt or boulder without moving). But it ISN'T Boulder Dash, so it's not a real complaint. Plus, the pixel art is good for warm fuzzies (and the 3D art isn't so bad. CGI Dan looks like Sean Penn, no?). I'm pretty sure I haven't repeated levels so obsessively since Lost Levels! Anyway great game, and I thought you wouldn't mind the incredibly late feedback? Really glad to hear you are enjoying the game. I always like to hear feedback, good or bad. I just wish I could have got the 3DS version out by now. It's pretty much finished, but we're just not happy with the art.